While messing around, importing pics to my new computer I ran across one of my favorite pics. This is from a couple years ago. Every year we seem to notice a lot of one or two different kind of bugs and such. This year was the year of the tree frogs…they were everywhere. The next year it was praying mantis and this past year it was toads and butterflies. On this day it was a very hot day. I was inside making lunch when Richard came to get me and camera. 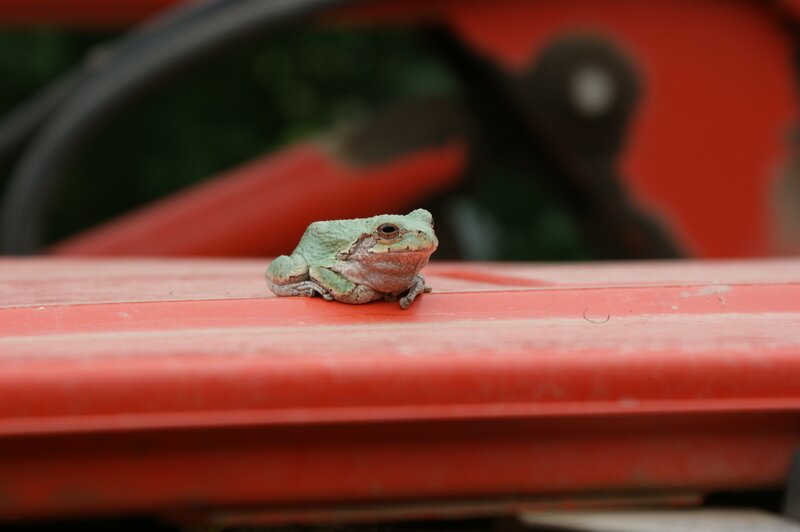 The frog had been hanging out on the tractor for awhile. It looks so comfortable but in fact the tractor was loud and hot and in a moment…it was gone. Next Next post: It’s so cold! !/ Snow Day!